What is common between Saint Francis of Assisi (1182-1226) and Jelaluddin Rumi (1207-1273)? 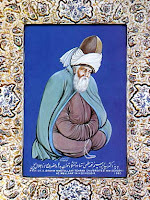 Both are ecstatic mystic of divine love and the common source might very well be Shams of Tabriz's inner illumination, who is more known as the guide of Rumi. What is less known is the accounts that St Francis was in contact with Rumi’s mentor at some important point in his life in Damascus. Saint Francis's love for nature and his hymns to the sun, moon, earth, and birds have captured the hearts of millions of Catholics, and the respect of millions of people of all faiths. This saint achieved the highest state of consciousness possible to man, a divine union with God. Sounds familiar to Rumi readers? Francis Bernardone was born in 1182, in Assisi in central Italy, into the family of a wealthy linen merchant, Pietro di Bernardone. The end of the twelfth century was a time of political turmoil, and as Francis grew to manhood he began to embrace the ideals of medieval chivalry as depicted in the troubadours' songs, influencing him to seek a military career as a knight. He was captured and imprisoned after his first battle (between Assisi and Perugia), and returned home a year later, very ill. Recovered, he determined to enlist again, this time fighting for the pope in the Crusades. The Crusades brought Francis to the Middle East, and there are accounts that St. Francis was in contact with Rumi's master, Shams, while Francis was in Damascus. Shams was a wandering dervish and Damascus was one of his most frequented places. Its very likely that Shams initiated and influenced Saint Francis with Divine love by whispering similar secrets which he whispered to Rumi. Both Saint Francis and Rumi show similar pattern in many aspects of their framing of emotion on Divine. Francis had many visions in his life, and it was around this time that one of these visions made him realize a military career was not for him. He returned home and began a new life, on fire with love for God. He began to devote himself to helping the impoverished and the afflicted. It is said that he embraced and kissed a leper, and experienced a baptism of joy and triumph over fear. Whereas Saint Francis abandoned his prospective career in military, in Rumi's case it was prestigious post as a theologian and professor, both driven by the all consuming fire of Divine Love. It is said of Francis that his love for God at times made him so wild that few understood him. Sometimes when Francis was traveling with this brother monks he would pick up a stick and pretend it was a violin bow and his arms a violin, and he would start playing the violin and singing French songs that his mother had taught him as a child. Francis would leap about and dance and become ecstatic. This is another parallel trend of Rumi's ecstatic whirling dance and that of Saint Francis. "The more I read about St. Francis the more I am convinced of two things: 1) He was the among the most genuinely committed Christians that ever were or ever will be. I mean, some may consider themselves good Christians, but Francis really went the extra mile in following Christ. And 2) The most lasting comparison comes from the Sufi mystics of Islam. A comparison that is not, in fact, too far fetched considering he likely got the idea of the Angelus three times a day from Islam, actively sought dialog with Muslims, and a Sufi legend reports that in his younger days he joined a Crusade and went to Syria where he played (and cheated!) at cards with Shams of Tabriz, the teacher of the great poet/theologian/mystic Rumi. If you want two pillars of the Church, look no further than Francis and Thomas Aquinas." - comment made by Matt Robare @ insight scoop blog.